Here's my second Max creation; It's an infantry unit, that COULD be called a Zone Trooper; it's my own concept, and is strongly based on Starcraft's Terran Marine, but it will fit like a Zone Trooper, since both are similar in concept. The unit has all the standart animations of a normal RA2 infantry. TS version, is about the size of a cyborg, and RA2 version is a bit bigger than a conscript. BTW, there's no cameo yet. It's a shame people are missing out this great infantry SHP - ome of the best I've seen in ages. Your new zone trooper is well done Machine. For a second max work I think it's awesome. I dont have max of my own... it phails to set up correctly on my pc you see. 1.) the movement is somewhat robotic. that is to say, in terms of human movement fluidity, your zone trooper's doesn't make it prefectly believable. You might argue that the zone trooper's armor clad and that prevents him from moving fluidly. But a power armor should enable easy movement. I give your Zone Tropper an 9/10. And I think that this suit actually makes movement more robotical. The armour just makes movement faster and enables the human to carry more weapons and gives better protection. I like it that way. Quite good, I would brighten it some though, detailing is quite ok but it hardly shows up when this dark. Texture seems stretched in the large render, does not show up on the unit ingame and not on the cameo so it is fine. 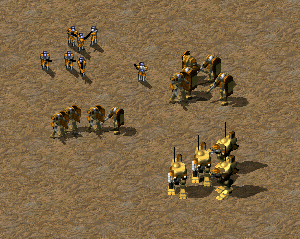 I like the rigid animations as well, especially for this kind of unit. Cameo is fine for TS but a tad to dark for RA2, nothing hard too fix though for anyone with some patience. Same FLH's as for the Cyborg Commando, but they work pretty good if you want to give the trooper a cannon etc. I followed more the design of the starcraft's marine than the zone trooper. As far as I remember some concept art made by Blizzard (Samwise), showed that the marine's leg is only in the upper part of the suit legs, the lower part was just mechanical components. This design is also present in a concept of the terran medic, which is in an even bigger suit. Though this idea isn't present in the game, were the suit is just a bit bigger than the soldiers; or in the scale models that are sitting over the computer while I write this. Anyways, you can always resize it with the basic tools for modding TS and RA2 (XCC Mixer, SHP Builder). Tourist: A person who travels a thousand miles to get a picture of himself standing by his car. Heh, thanks man, for showing your appreciation of my work, that's always a nice thing . However next time please check the last post date (on the lower right corner, of the last post), as topic bumping is not appreciated in the community (unless it's good and constructive, and not just an opinion). Machine: Everything in spotlight SHPS can you post in. Is the same with the dato, hello is spotlighted why he can't post then? If it was in the original shps tread then okey. But he just say what he think about it, and is okey. I think so because is in the spotlight tread. So leave he a long? And let he make some more comments, the author will like it . Maybe he even finish the shp? or improve it? Hey Anderwin, I liked that he bumped the topic to show his appreciation of my work. I just tried to tell him to not make that a habit, since people do not like that. It was not meant to be an attack in any way . I did not attack or angry on you. If it feel like thats I sorry. Anyways is a kickass shps dude. In Allied recolor it fits really good to RA2 Allied. Hmmmmmmm........ The feet looks like a juggernaut then the other looks like a Predator. i not understand wat your saying?